Thousands of anchovies washed up on the shores of Puget Sound in Washington last week after hot weather over the weekend changed the feeding patterns of the fish, state wildlife officials say. KOMO News reported. "It's sad. 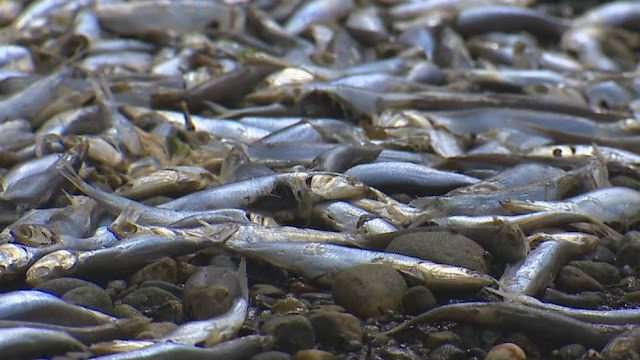 It's really sad," resident Kristen Wiseman told KOMO of the THOUSANDS of dead fish scattered on the beach near her home. State fish biologists told the news station the hot weather last weekend prompted the fish to swim closer to the shore to feed on plankton. When the tide went out, the anchovies became trapped and died from a lack of oxygen. "And so now it's lots of fish using up lots of oxygen trapped in shallow rapidly warming water and effectively what happens is the fish get cooked," Dr. Dayv Lowry, a Department of Fish and Wildlife research scientist, told KOMO. According to weather.com meteorologist Chris Dolce, temperatures in the area reached the mid-80s over the holiday weekend, which is about 20 degrees warmer than average for the area in late May.